10 areas in the nation recorded maximum temperatures between 35 and 37 degrees Celcius for three days in a row. Feel like you’re satay grilling on an open fire these days? It’s not your imagination. Temperatures in Malaysia have soared since the start of the week, with at least 10 areas in the nation recording maximum temperatures between 35 and 37 degrees Celcius three days in a row. 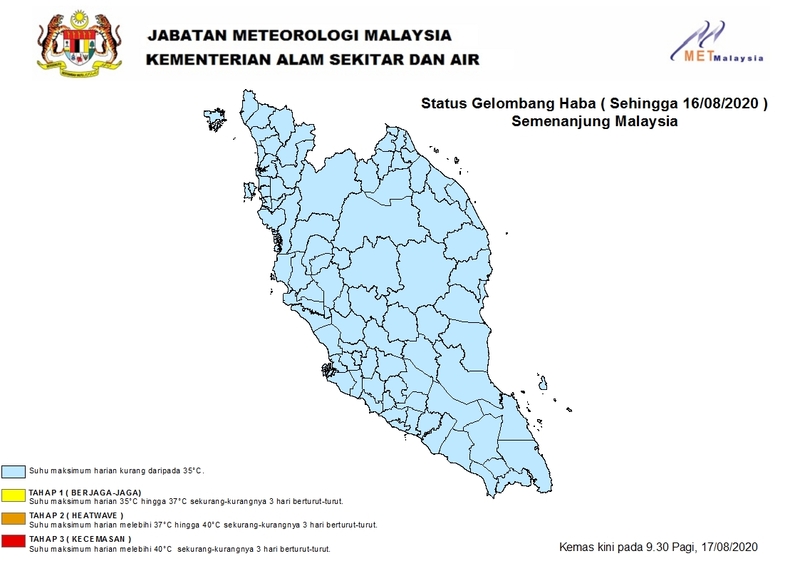 The weather has been so hot that the Malaysian Meteorological Department (MetMalaysia) has issued a level 1 alert for these ten areas: Chuping (Perlis); Kubang Pasu, Kota Setar and Sik (Kedah); Hulu Perak, Kuala Kangsar and Kinta (Perak); Maran (Pahang); Kepong (Kuala Lumpur); and Muar (Johor). According to The Star, this is double the number of areas on heatwave alert two weeks ago. The nation-wide heatwave is expected to last until April, it added. The 10 areas put on level 1 alert. In a report, the New Straits Times (NST) said that most of Peninsular Malaysia are also experiencing a dry spell, with recorded rainfall less that 150mm. “Perlis, southern Terengganu, Pahang, Selangor, Kuala Lumpur, Putrajaya, Negri Sembilan, Melaka and Johor are expected to receive less than average monthly rainfall (this month),” the report said, quoting MetMalaysia. Water supply is also a concern for some states, including Perak and Kelantan, The Star said. Despite the discomfort caused by high temperatures, hot weather is a “normal phenomenon” usually experienced at the tail end of the north-east monsoon, The Star added. In Malaysia, the temperature alert helps agencies take appropriate action in response to changes. A level 2 alert is issued when maximum temperatures exceed 37 degrees Celcius for three days in a row, while a level 3 will be raised when this hits 40 degrees Celcius, NST said. A state of emergency can also be declared by the Prime Minister in the worst case scenario.